The Christmas Shrine Photos by Samuel E. Warren Jr. The Virgin Mary statue is the centerpiece of this outdoor Christmas Shrine on the porch. 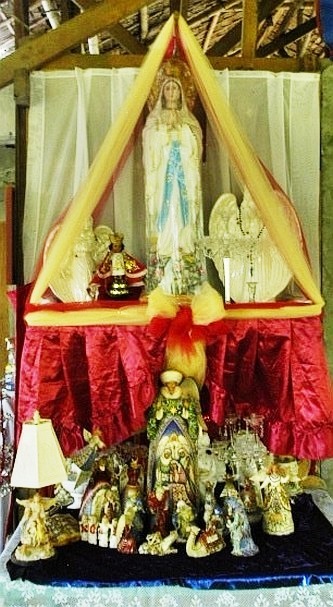 The Santo Nino and two ceramic angels share the wooden shelf. Transparent yellow lace-like cloth drapes down over the wooden dowel rod above the statue. The material flows down over the edges of the shelf to create the triangular pattern. 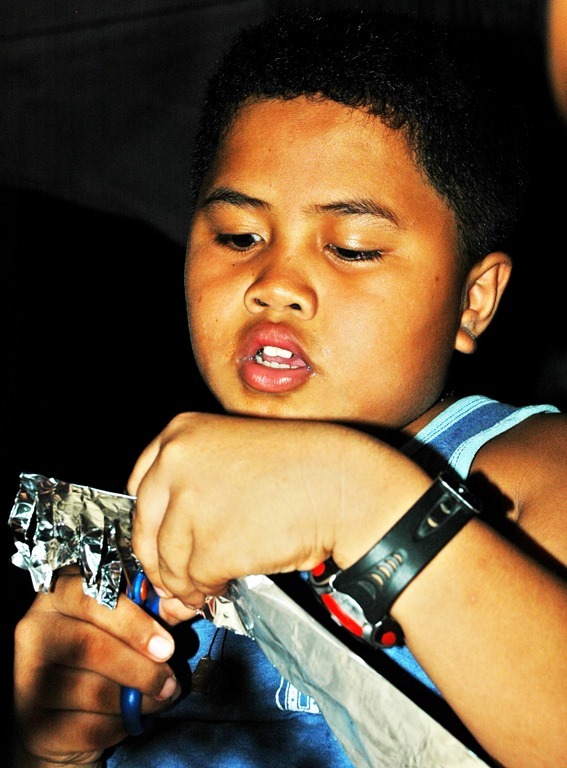 The material is tied together in a bow to complete the pattern. A candlelabra sits on the shelf, but is never lit because the cloth material is flammable. 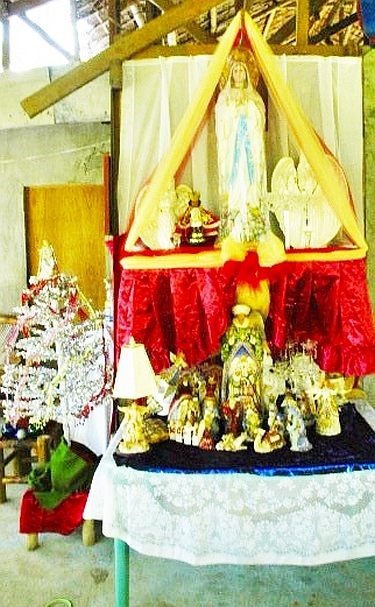 The angels and the nativity scene on the Christmas Altar completes the Christmas Shrine design. Ramon Q. Saldana Jr., Christy’s brother, built the shelf attached to the wall for the Christmas Shrine and positioned the wooden dowel rod. Christy Warren designed the overall Christmas Shrine arrangement. 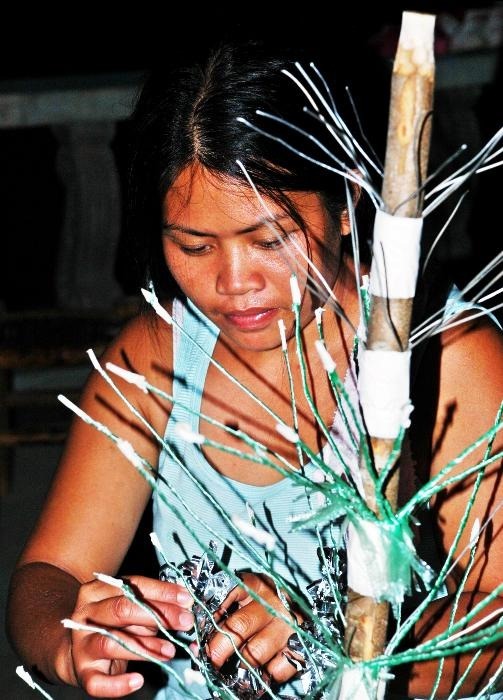 She believes, “You use what you have”, when it comes to crafts projects. Her vision is responsible for the artificial exterior grotto, which observes the sacred nature of the season. The bottom photograph reveals that a lace tablecloth serves to conceal the inexpensive aquamarine plastic table of the Christmas Altar. 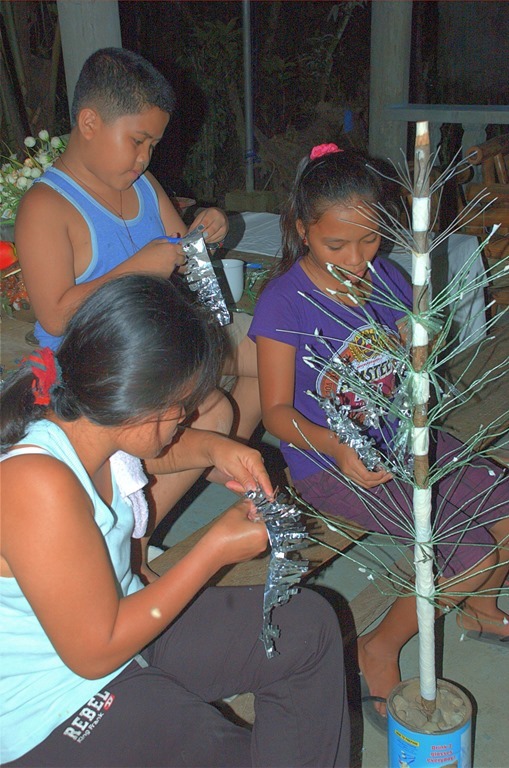 This photograph demonstrates that the Christmas Shrine serves as a centerpiece to the porch design and becomes a focal point for the small Christmas Tree and the accompanying seating area. Nikon D 70 Photos by Samuel E. Warren Jr.